So, how does this tool work? RFID is a system consisting of a RFID tag or smart label, a RFID reader, also called an interrogator, and an antenna. The tag contains a circuit and an antenna, which transfers information to the reader. Once the information is transferred, the reader converts the information to a more usable form of data. This information is then transferred to a computer database through software. Now that we know how RFID systems work, let's talk about why your company would want to implement an RFID system. Many manufacturers need to count products several times during the span of one day. By using an RFID system, these products can be counted in seconds, decreasing the amount of manual work, and in turn, reducing costs. In addition, RFID scanners do not have to be in line of sight of the tag, and the scanners can also read more than one tag at a time. As we mentioned, RFID systems are able to contain much more information than a barcode. The system can contain information such as real-time movement of products, amount of time needed for production, and which machines have and haven't gone under maintenance. 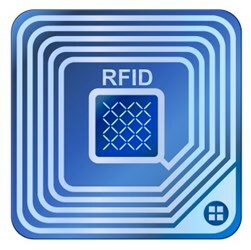 Some other benefits of the RFID system include: accuracy, efficiency, quickening of the manufacturing process, greater visibility, and improved planning. A critical element of the RFID system is the middleware (software) that aggregates, manipulates, and analyzes tag data. Radley can provide the middleware solution, and also help select the best hardware and equipment needed for your system. If you are interested in a RFID Solution, schedule your free consultation with a product specialist today.